The Leaf turns 6 years next month. Time for a long due update! 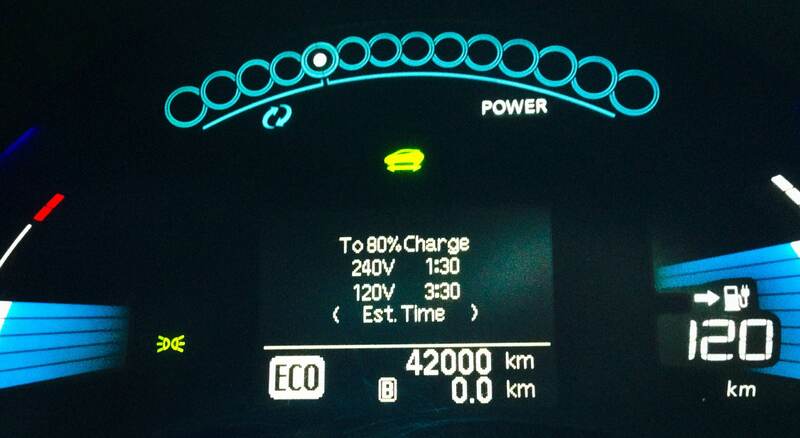 The Leaf has now more than 125,000 km and so far no major issues. With the full warranty long gone, the only out-of-warranty thing that broke and had to be replaced was the driver’s side power window switch. In terms of maintenance, an annual service check is all that takes to keep it running in good shape. While the Leaf is already rolling on its second set of summer tires, the brake pads are still the original ones and the car is yet to need any brake service. Battery capacity has been dropping as predicted by Nissan, (about 4% per year). 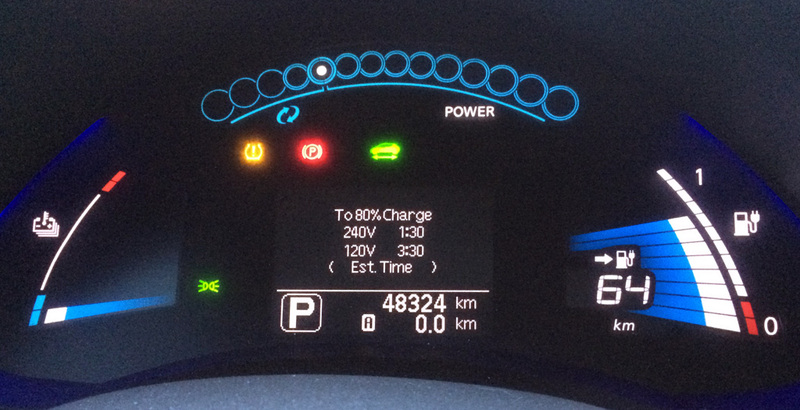 Leaf Stat now showing an SOH of 76.1%, which translates to about 16.3 kWh of usable capacity. With lower capacity comes shorter range. 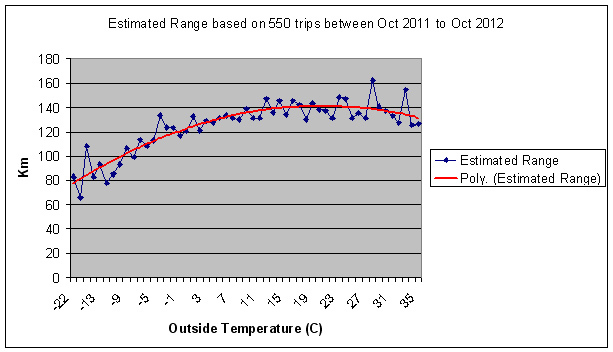 Even during the summer, I rarely get more than 120 km of estimated range. Fortunately, thanks to the Province of Ontario, there are now about a dozen DCQC fast chargers installed in and around the Ottawa region, which in practice extended my range significantly. In addition, the Province Quebec has even more fast chargers available at the other side of the border. We can now easily drive to places like Montreal, which used to be a challenge in the past. 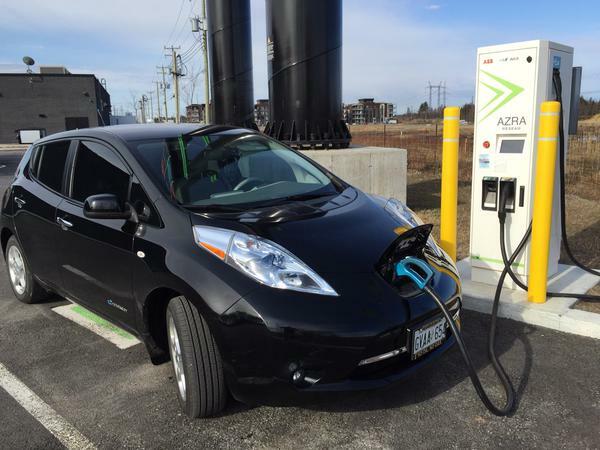 Last year was the fifth anniversary of the Leaf’s first delivery in Canada. I gave an interview to The Globe and Mail discussing my ownership experience. Other news outlets like the Green Car Reports and Auto World News also published related stories. By re-reading the interview, here are a few things I would add based on the events from year #6. Still no problem driving in the winter but the drop in capacity is starting to take its toll. To complicate matters a bit, we’re moving to a new house next year, about 50% farther from work, so a longer commute with a smaller battery will be more of a challenge. The good news is that there are at least two fast chargers operational right now on the new route, which I’ll be able to use in case of emergency. 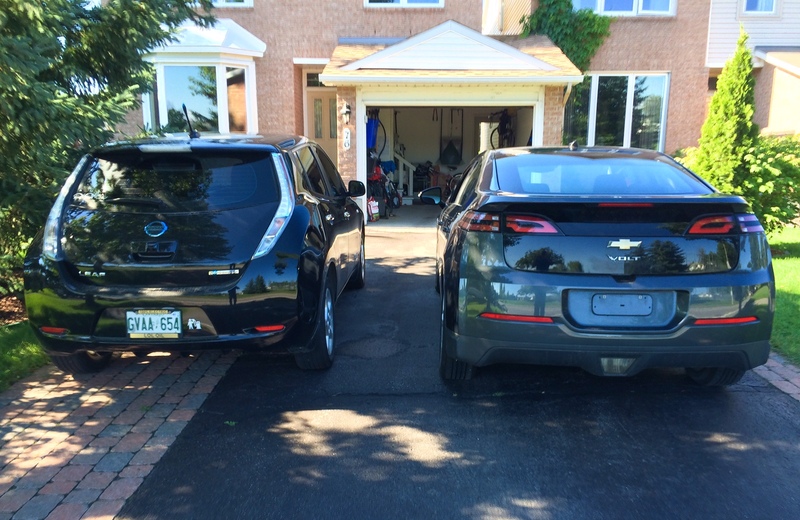 Last year I said the EV rebate in Ontario had gone up from $8,500 to $12,000. Well, now it’s at $14,000! The Leaf has never been so affordable in Canada. On the other hand, the plans for a super off-peak electricity rate overnight haven’t quite caught up yet. Apparently determining the hours for such tariff is a bit of challenge for the province given the fluctuating nature of low demand and negative costs. Our average all-in cost per kWh over the years. A lot has been said about “sky rocketing” electricity costs in Ontario, but frankly I really haven’t seen anything like it on my bill. I understand residents of rural areas are paying high delivery costs, and on-peak rates are indeed much higher than we were used to pay before time-of-use was in place, but our house is deep inside the city and we put an extra effort into shifting 80% of our consumption to off-peak hours. As a result, we haven’t been really seen a significant increase. I’ve been monitoring our own electricity usage for years and this is what I see on our bill: Between Jan 2013 and Mar 2017, our average kWh rate (all-in) went up 20.5%. That’s it. About 4.7% a year. While that’s well above inflation, I wouldn’t call that sky rocketing, especially when gasoline can go up the same amount in one week without any warnings. Reality is, the cost of driving with electricity continues to be very small compared to driving with gas. About 75% cheaper. In our case, it is as if we were paying about 25 cents a litre (instead of a dollar). In places like Quebec, where electricity is cheaper and gasoline is more expensive, the savings are even greater. Update: The day after I wrote this, I checked the electricity rates at the Hydro Ottawa website and realized it’s election year! LOL As a result, “as of July 1, 2017, your electricity bill will be reduced by 25% on average if you’re a residential consumer. This includes all households across Ontario.” — I re-did all my calculations and we’re now paying the same off-peak rate we were paying in May 2012! My biggest surprise is actually how well our 2012 Volt is performing. While our Leaf has lost 24% of its battery capacity, the Volt has absolutely no battery degradation (not that we can notice, at least). This past weekend we went on a long trip and measured how many kWh it would be able to use on a full charge. Over the years, I noticed that this number varies, hovering around 9.7 kWh and 10.1 kWh, while the nominal value in the specs is 10.3 kWh, but we never got that. On the above image, you can see that it still offers the same 10.1 kWh of usable capacity even after 5 years and 93,000 km. Even if you compare it with the official 10.3 kWh, the Volt still has 98% of its original capacity which is very impressive after all these years. The reason is of course the active thermal management present on the Volt but not available on the Leaf. This is the single most important thing I’m expecting to be introduced on the 2018 Leaf to be announced next month. If the Leaf continues to be air cooled, I don’t think I’ll get another Leaf again. The Leaf has evolved from a 24 kWh car to a 30 kWh, and we’re now expecting a 40 kWh version (or higher) to be announced next month. The Chevy Bolt was launched late last year with 60 kWh, and the Tesla Model 3 has an 80.5 kWh battery. We still don’t know when the Model 3 is going to be delivered in Canada. Most likely estimates, for someone who doesn’t work at Tesla and doesn’t own a Tesla, is end of 2018, which is actually not a bad timing for us. The only question is if we’re really going to afford a Model 3 (the word “affordable” before “Tesla” is very relative). The good news is that there will be a few other options available by the end of next year. The Bolt will be more mature, and hopefully have more discounts, and the Leaf may also be an option (assuming not air cooled as per above). One way or the other we have time to decide, and all indications are that both Leaf and Volt will hold just fine until there. Fingers crossed. We hit 100,000 clicks this past weekend. Not bad for a car that “can’t go very far” LOL. It took us 4.5 years to do it. That’s 22,222 km per year, quite a bit more than I had originally predicted. And definitely more than any other car I had in the past! Overall, the Leaf is still doing vey very well, with no major issues. The only out-of-the-warranty item I had to replace was a faulty switch on the driver’s power window. Nothing else. The AeroVironment charging station is still working as new. Battery capacity is at 83%, still more than enough for my daily commute. It’s been almost a year since we lost the first bar at 84% so the drop in capacity has slowed down considerably. I don’t expect to need a battery replacement any time soon. The Volt continues to work well as well. We barely use any gas in the spring, summer or fall, but in the winter it’s pretty much unavoidable. In the colder months, range drops to just 35 km, and the gas engine kicks in for a few minutes when temperature drops below -4C, which is pretty much the whole time here in Ottawa during the winter. We made a reservation for a Tesla Model 3, which is expected to be delivered some time in 2018. The 350+ km of range and the access to superchargers will be a dream come true. The Leaf will be 7 years old when the Model 3 arrives. It will probably become my son’s car. The only problem is that my wife wants the Model 3 for her so I may end up driving the Volt… Hmmm. Maybe I’ll give the Volt to my son and keep the Leaf. We’ll see. Another exciting news is that we should be getting a lot of DC Fast Chargers here in Ontario this year, as part of a 20 million dollars program by the province. The locations are expected to be announced any day now. We should also be getting more DC Fast Chargers along highway 50 between Ottawa and Montreal, in addition to the two that are already operational. On top of all that, the federal government just announced today that a national plan for fast charging stations will also be implemented across Canada. Our dashboard now shows 12 bars of charge but only 11 bars of capacity. Oh, well. It finally happened. Not that I was looking forward to it, but it was something we couldn’t avoid. Our LEAF has lost its first bar. A brand new LEAF is delivered with approximately 100% of the rated battery capacity (24 kWh, of which about 22 kWh is usable). As it happens to all batteries, the ability to store energy slowly degrades with time and usage. 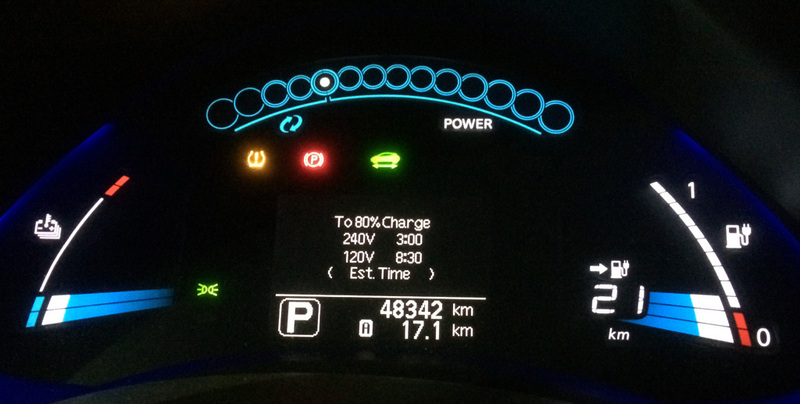 The LEAF shows up to 12 bars of capacity on the dashboard, indicated by those short bars located to the right of the (longer) charge bars. While charge levels will always go from 0 to 100% (of the available capacity), the capacity itself will slowly decay from the original 100% down to a level where it is no longer useful. The rate of decay depends of many factors — battery chemistry, mileage, age, average temperature, etc. Earlier versions of the battery, mine included, are mostly sensitive to high temperatures, which is not really a problem here in Ottawa. The second main factor appears to be age, as many of my 2011/2012 LEAF friends already lost their first bar regardless of their milage. Milage is also a factor but apparently not as much as age. So, how much capacity have we lost? The first bar disappears after capacity drops below 85% (15% loss). I’ve been monitoring the battery capacity with an iPhone app connected to the OBDII port for the past two years. Capacity was about 88% when I first started monitoring it in 2013, and reached 84% in the beginning of June. It was just a matter of time until the computer noticed it and turned off the top capacity bar on the dashboard. Capacity bars are not linear. The first one goes away after you lose 15%. Subsequent ones will disappear each time you lose 6.25% (2 bars lost at 21.25%, 3 bars lost at 27.5%, 4 bars at 33.75%, and so on). The Nissan warranty will swap any battery that loses more than 3 bars in less than 5 years, but that’s not likely to happen in our case. Capacity loss is also not linear. We lost about 11-12% in the first two years, but only 4-5% in the last two. Despite the disappointment, the loss of our first bar was by no means unexpected. The official estimate from Nissan, from the very the beginning, was for the LEAF to keep 80% of its original capacity after 5 years, which is pretty much dead on (ours has 84% after 4 years). As for the future, I think it will be a few years before we deem necessary to replace our battery. 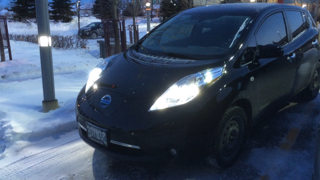 Even at 84% capacity, the LEAF still offers enough range to cover most of our daily trips in the city, even during the winter. Being able to charge at work makes it even easier to get through the day. Actually, I still charge the LEAF to 80% most of the time. On top of that, we still have the Volt available for longer trips. Nissan offers a battery trade-in replacement for about $6,000, which is not a bad deal, but not necessarily appealing if all you’re getting is an extra 25% of capacity back. HOWEVER, there are strong indications that a 30 kWh pack will be available this year (on 2016 models). If the form factory of the new battery is compatible with older models, then an upgrade will be much more appealing. Even today, such upgrade would give us 60% more capacity than what we have right now, which will be really attractive. In conclusion, losing the first bar may have a big psychological effect on most owners but reality is capacity loss is a continuing factor. The LEAF will lose a little tiny bit of capacity on a monthly basis but it will take 3 to 4 years for that drop to be translated visually in terms of bars on the dashboard. On there other hand, as my friend Kelly Carmichael says, the range of the LEAF actually increases with time as more and more fast charging stations are installed. In our case, DC Fast Chargers are expected to be installed along highway 50 between Ottawa and Montreal this year, allowing for trips that were not practical even when our LEAF was brand new. It’s been a while since I posted the last update and a lot of things have happened since then. First and foremost, the Leaf is still doing great after almost four years. 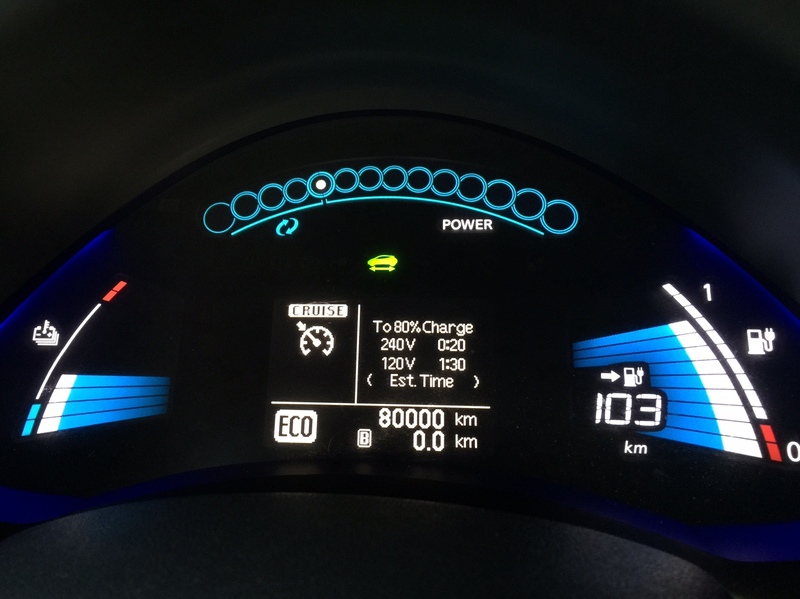 We recently hit 80,000 km at the odometer and we still have 12 bars of capacity on the dashboard. We don’t have any major issue to report. We did our last service check in July last year, a few weeks before the full warranty of 60,000 km expired. I’m planning to take it for another checkup this summer, and keep it on a regular yearly basis (I used to take it for a service check every six months but now I realize that’s not really necessary). The main major service I expect to perform this year is the flushing of the brake fluid, which was never needed in all inspections done so far. But after 4 years, it’s probably about time to get a new one. The best testimony that an electric car works well for us is that we now have a second one! We finally got rid of the Corolla last fall and exchanged it for a Chevy Volt. My wife drives the Volt now. She was never a car person. She drives one mostly because she has to. But after driving the Volt on a regular basis, she says it’s the first car she actually likes! The silence, the smoothness and the cool looks… she really enjoys it. And I do too. I’ve been keeping track of how the brake pads are doing since I first took the LEAF for service. As you probably know, most of the braking on the LEAF happens by regenerative braking where the electric motor, not the brake pads, are used to slow down the car. The brake pads are only used when you’re about to stop completely. They’re also used if you hit the brakes too hard, something I try not to do very often. At this rate, the rear pads will last a long time. I estimate that they will need to be replaced at 146,000 km, with the front pads lasting a little longer (194,000 km). There have been reports of brake issues affecting the LEAF in the coldest days of the winter but it seems to be affecting only cars manufactured in North America. Our LEAF was made in Japan and has not presented this issue. The bumper-to-bumper warranty expired last year after 60,000 km. We actually hit it before the 3 years of ownership. I asked the dealer to perform a service check while the warranty was still on, just in case, but they didn’t really find anything. This winter however, the driver’s power window stopped working. I was hoping it was a cold-related issue that would resolve by itself in the spring (we saw something like this before) but it hasn’t been the case. I’m bracing for how much fixing it is going to cost, but I don’t think the repair will be much different than in any other car. The dashboard still shows 12 bars of capacity but that doesn’t mean 100%. I used an OBDII adapter and an iPhone app called Leaf Stat to peek into the battery data and check how much capacity is really left after all these years. Right now, this number is hovering around 86%, which is fairly inline with the estimate of 80% capacity left after 5 years. It’s worth noticing that the first bar of capacity on the dashboard will go away when the percentage drops below 85%, so I expect it will happen any day now. It’s been a long time waiting but I was finally able to use the DC Quick Charge port on our LEAF for the first time. However, I had to drive all the way to Montreal in order to do it. I charged at the closest DCQC from Ottawa, a station installed by Azra Networks about 200 km from our house. The trip required an extra stop at a Level 2 charging station in Montebello, which made the trip not very practical, specially because we don’t have the faster 6.6 kW charger available in the newer LEAFs. Fortunately, this is about to change. Hydro Quebec is actively planning to install Fast Chargers along highway 50 between Gatineau and Montreal, which will be a game changer for us. Rumours are that the first DCQC will be installed this year. We’ve come a long way since the first LEAF was delivered in Canada four years ago. Now I see electric cars on the road every day. One morning I even saw two LEAFs on my street, only 5 minutes apart from each other. One place where EV adoption suddenly had a big spike was at my workplace. For several years, there were only two EVs for the two plugs available for charging at our parking garage: the LEAF and a converted motorcycle. Suddenly, this month, a co-worker purchased a Smart ED, another bought a Tesla, and another placed an order for a LEAF! All in the same month! Now those two spots are no longer enough and we started the process to lobby to have charging stations installed at work. I’ll keep you posted. Last month, parts of the US and Canada braced for record-breaking low temperatures as a blast of arctic air blew across North America. Here in Ottawa, the thermometer stayed below -20C for three days in a row, plunging to as low as -28C. 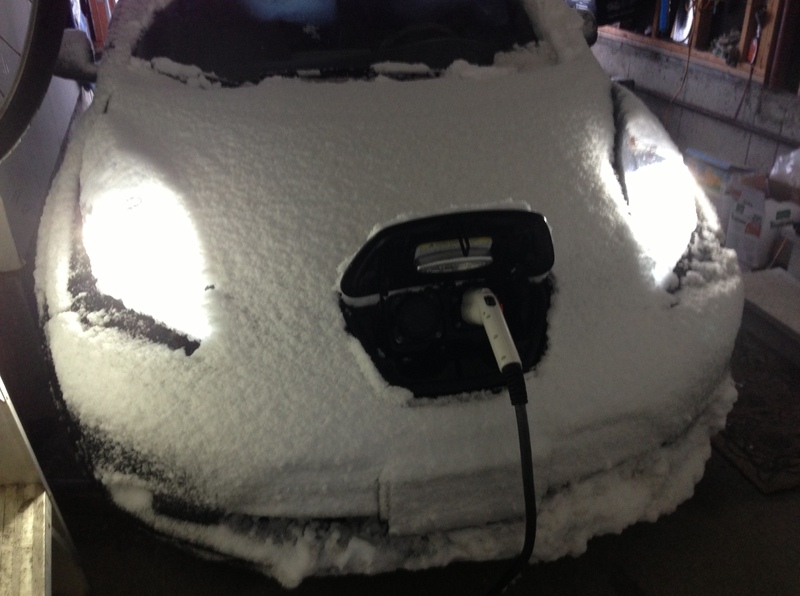 A temperature of -25C is an important threshold for the LEAF batteries because the chemical process that produces electricity will basically freeze at that temperature. To prevent that from happening, the battery pack is surrounded by thermal blankets and electrical heaters to keep it warm. According to the Owner’s Manual, the heaters kick in at -17C, heat up the batteries to -10C, and then turn themselves off until the battery temperature hits -17C again. The heaters consume about 300 Watts when running, which is not a lot energy compared to what the motor uses (up to 80 kW). If the car is plugged in, the heating energy comes from the grid, but if the car is unplugged, the heaters will use electricity from the battery itself, creating yet another impact on total range if you park outside for long periods of time. Another important point to keep in mind is that the heaters will only turn themselves on if the batteries are at least 30% charged. What happens if there’s not enough charge? 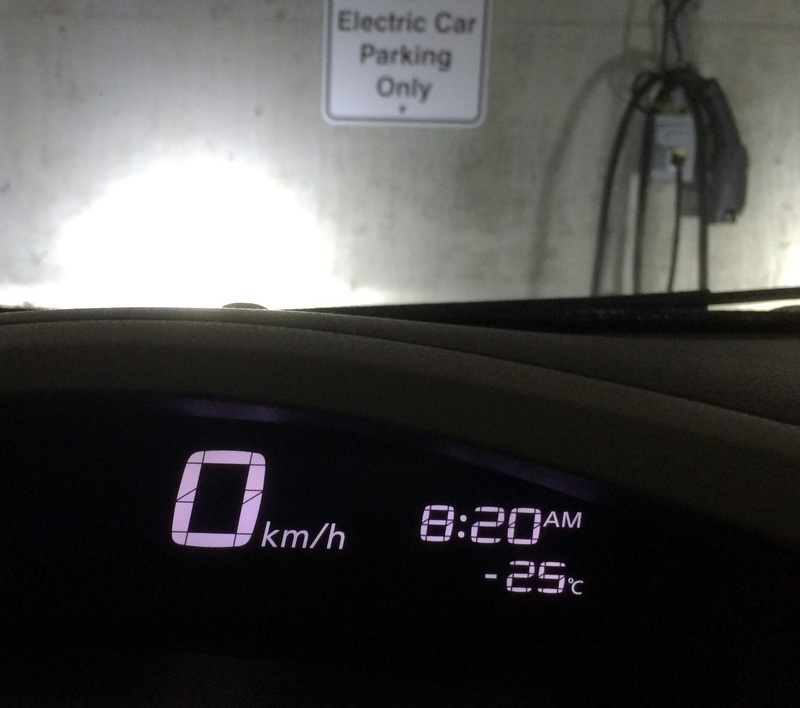 Well, if the battery temperature drops below -25C, a safety mechanism will prevent the car from operating. You will either have to wait for the air temperature to rise again or plug the car in so that it can warm itself up using energy from the grid. That’s all the theory but how often do the battery heaters run in practice, and how much energy do they use? I ran a little experiment during the cold snap by leaving the car unplugged during the night and also during the day, and used the data logger from FleetCarma to verify how much energy was effectively used. I also measured the impact on my daily range, simulating the case where I would not able to trickle charge at work. 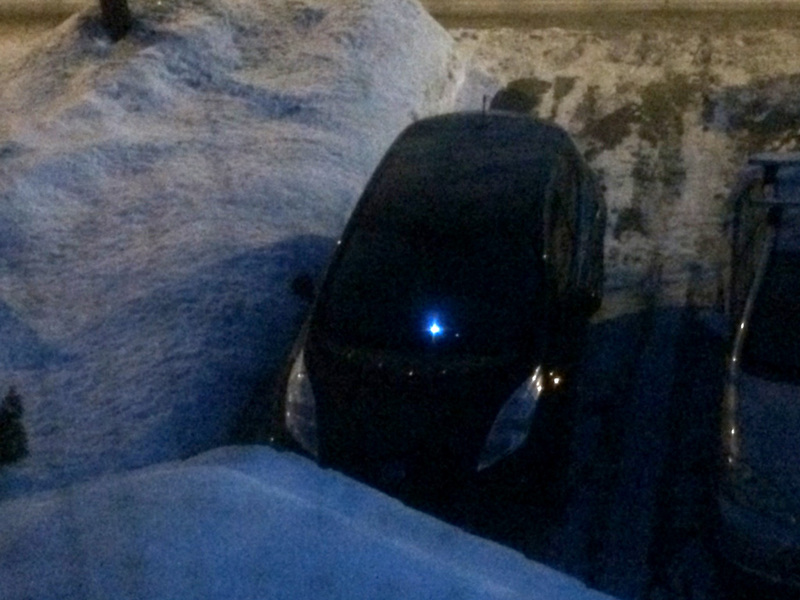 With the weather forecast calling for very cold temperatures overnight, I charged the LEAF to 80% (10 bars) and left it parked outside for the night, to see how the battery heaters would work. I also wanted to measure the effect of driving to work in the morning without any pre-heating from the grid, basically the opposite of what I would normally do — a worst case scenario we all try to avoid. The result was quite interesting. Early in the morning, with the temperature just a notch from -28C, I actually caught the LEAF in the act. From inside the house, I could see the bright blue charging status indicator lights blink in a specific pattern, showing that the battery warmer was busy doing its work. CarWings indicated that the battery charge had dropped from 10 to 8 bars overnight. 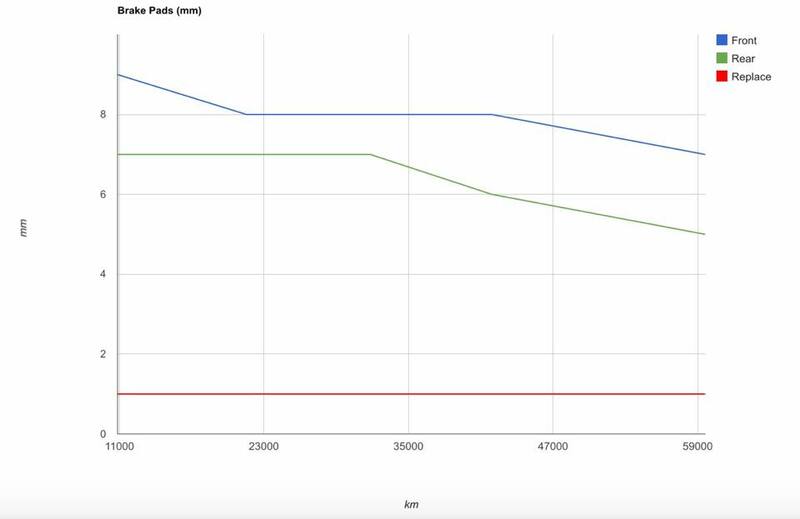 More precise data from Fleetcarma showed that the battery warmer ran for 2 hours and 42 minutes, bringing the battery charge from 79.6% down to 67.4% (a 12.2% loss). Once inside the car, the dashboard confirmed the 8 bars of charge. It also showed a single bar of battery temperature. For some reason, the car thermometer showed -23C, almost 5 degrees warmer than the outside temperature. Notice the estimated range of 64 km. That is very optimistic. It usually takes me 2 to 3 bars to get to work without any climate control, but at this temperature, with no pre-heating and with the cabin heater on, it took me 5 bars instead. As you can see on the left, I arrived at work with only 3 bars left and estimated range of 21 km. Fleetcarma data showed that the 37 min, 17.15 km trip reduced the battery charge from 67.3% to 39.8%, arriving at half of the original 80% charge I had in the morning. As for that optimistic range of 64 km, in reality it was more like 38 km (with an 80% charge). With -25C on the dashboard thermometer, the remaining 21 km of range would be enough to take me back home. However, if I had to spend 8 to 9 hours at work with the car unplugged, the battery warmer would probably kick in during the day again causing the estimated range to drop. Fortunately, I have access to a 120 V outlet at work, which makes a big big difference in winter, so that wasn’t a concern. So, parking outside unplugged overnight: definitely not a good idea! On a different day, I did the exact opposite: parked overnight plugged-in as usual inside the garage, and parked outside the whole day at work unplugged. The battery warmer did not kick in at any time during the night, even though my garage is not heated. Temperatures during the day were not as harsh as during the night, going from -27C at 8am to a high of -22.5C at 4pm. 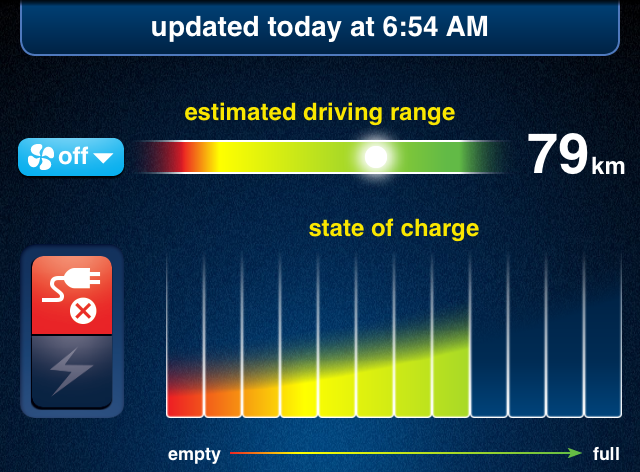 I left to work with a full charge (88.7% SOC), drove the same 17 km, arrived with 67% left, or 77 km of estimated range. I parked outside as planned. The battery warmer kicked in 4 hours later and ran for 3 hours and 7 minutes, causing the battery charge to drop from 66.3% to 57.5%, an 8.8% loss. Before I left work, I pre-heated the cabin remotely, while still unplugged, which took another 1.7% of the charge, down to 55.8% SOC. I arrived home with 37.7% charge, or 26 km of estimated range left. Total range for the day (with a full charge, without charging at work): 34km driven + 26 km left = 60km. Conclusion: Parking outside at work is not as bad as parking outside overnight, mainly because hours are shorter and temperatures are usually higher so impact on range is not as critical. So how much energy does the battery warmer consume? For temperatures varying between -22C and -28C. One of the best things about driving an electric vehicle is to pass by and never have to fill up at gas stations. Because electricity costs so much less, and electric cars are so much more efficient, we end up saving a fair amount of money in fuel. This year I decided to put some of these savings toward a good purpose. 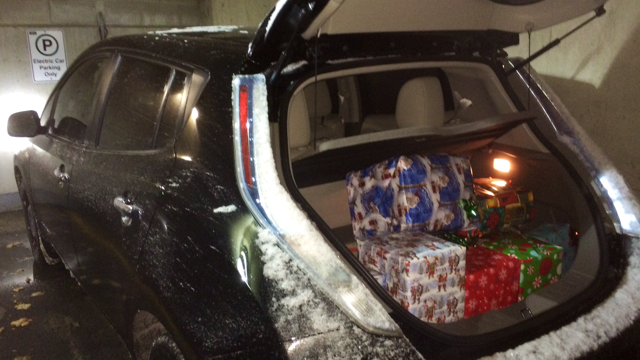 My employer, IBM Canada, runs a volunteer program called Adopt-A-Family, which helps to provide for families living in local Ottawa shelters during the Holiday Season. I’m also very grateful to IBM for letting me charge at work, which makes my life so much easier. Putting it all together, I thought it would be more than fair if I could match and donate their electricity costs to one of the families in need. I did all the calculations using the data collected with the C5 Data Logger from Fleetcarma. By adding up all Level 1 charging sessions during work hours between October 2012, when I first started using the logger, and October 2013, I figured that on average I used $2.18 of electricity, or about one large cup of coffee at Tim Hortons… per week! That comes as quite a surprise to most people, as they learn how little it costs to drive electric. The grand total for the year was $113.36. I decided to donate an additional 10% in order to reach $125, which is half of what I need to provide for one single-parent family with two kids. I’d like to ask other EV owners to also get some of that gas money and make a donation of any value to help us reach the $250 goal. If we manage to get more than $250, we can direct the funds to a bigger family or even adopt a second one. Maison D’Amitie (The Friendship House) is a shelter that supports women victims of violence and their children. They’ve been working to ensure the safety and well-being of women since 1976. Maison D’Amitie is a friendly and accessible safe place where women can be listened to and supported through their journey. As one of only two francophone shelters in the National Capital region, their presence is much needed in this area to combat and put an end to violence against women. Kitchen supplies including pots, pans, dishes, cutlery, etc. The Adopt-A-Family Program encourages us to include a gift card with the hamper. This would give a mother the ability to purchase some gifts for her children or maybe buy food for a Christmas meal. In lieu of purchasing food items, we will include a gift certificate from a local grocery retailer identified by the shelter. If you prefer to send me a good old cheque, I’ll send you a private message with my mailing address. Please note these donations are not tax deductible. If you are interested in donating money directly to Maison D’Amitie, they will be able to issue you a tax receipt directly. I will need to purchase and deliver all the goods by Tuesday, December 10th. Let me know if you have any questions and Thank you so much in advance! Update: Wow! It only took us 20 mins to reach the $250 goal. That was amazing!!! Really really appreciated! Let’s keep it on and see if we can get enough to support a second family! Update (Dec 9): Today is the last day to donate. I need to bring all the items tomorrow morning. So far we have raised more than $350 and still counting! 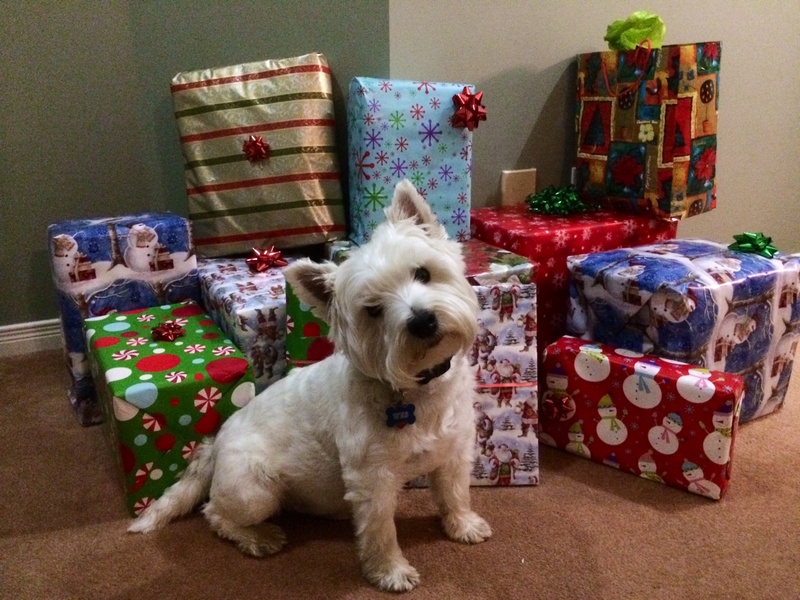 Update (Dec 10): Gifts delivered today (Westie not included). 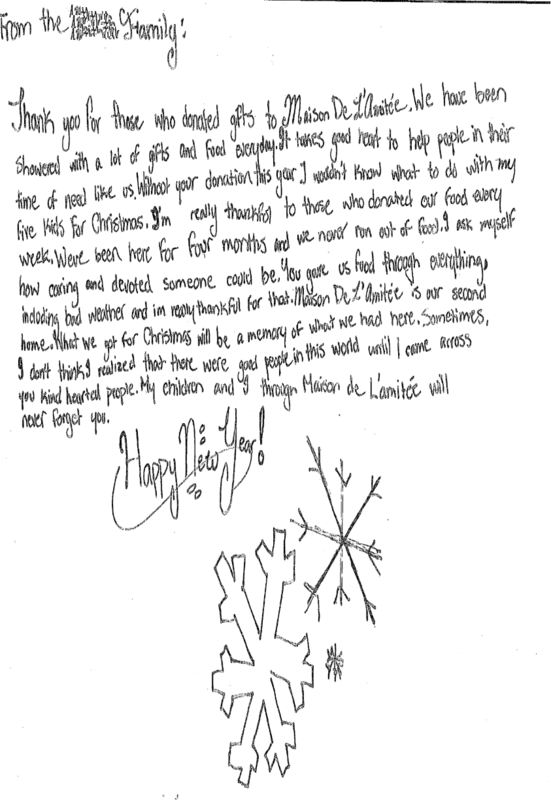 Update (Feb 16): Thank-you letter received from the family. Very moving. Thanks to everyone who donated. 42,000 km (26,250 miles) and going. Our LEAF turned two this week. It’s been an absolutely great experience. The LEAF has been performing very well, we haven’t noticed any battery degradation and it’s still a lot of fun to drive, like day one. This week I took the Leaf for its 24-month scheduled maintenance service at Hunt Club Nissan, the dealership where we took delivery two years ago. According to the maintenance guide, the service should have included replacing the brake fluid, replacing the in-cabin micro filter, rotating tires and a inspecting a long list of items. Interesting enough, absolutely nothing needed to be replaced! Tires were rotated, the battery was tested, items were inspected and that was it. Details below. The brake fluid still looked like new and didn’t need to be flushed. That would have been a costly service that I’m glad the Leaf didn’t need. As for the brake pads, it’s about the same story: We still have a long way to go before we need new ones. That’s one of the best things about regenerative braking. It recovers kinetic energy back into electricity without actually using the regular brakes like in regular gasoline cars. Brake pads are only called into work when the car is just about to stop, or if you brake too hard. Brake lining after each maintenance service. Brake pads are recommended to be replaced when they are 1 mm thick. They were first measured at the first 6-month service, when the Leaf had about 10,000 km. 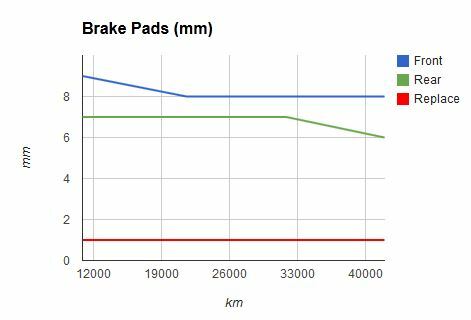 Since then, both front and rear brakes only lost 1 mm of thickness. At this rate, I estimate I’ll only need to replace them at 186,000 km (rear) and 248,000 (front). Pretty good, eh? Nissan recommends changing the in-cabin microfilter every year. The dealer replaced it last year but the old filter still looked pretty clean. Besides, the replacement cost was a hefty $72. Later I realized you can purchase the filter online (for $15) and replace it yourself. That’s what I did this year but I decided to delay the replacement until after 18 months, to wait and see how dirty it gets. The original Ecopia tires are still doing well, given that we only use them 8 months a year (we switch to winter tires during the other 4 months). The tire tread depth on all four tires have dropped from 7 mm to 5 mm (6/32″). The minimum depth recommended for summer tires is 1.6 mm (2/32″) so they still have a long way to go. At this rate, I estimate we’ll need to get new summer tires at 75,000 km. The Battery Usage Report, which is a mandatory test required by the warranty, passed with flying colors, or five stars, in all categories (charging, driving and storage). The Leaf still has 12 bars of capacity, which is great. Any drop in capacity at this point is still not noticeable. I’ve been keeping track of the Leaf’s performance since day one. In these two years we used 5.5 MWh ($658) of home electricity, plus some trickle charging at work, camping sites and the few public charging stations currently available in Ottawa. I estimate that driving the same 42,000 km with our second car, a Toyota Corolla, would have cost us $4,750 in gasoline, plus $250 in oil changes, plus $200 in additional insurance (yes, our insurance company has a fairly good rate on EVs). In total, we have saved $4,542 so far by driving with electricity, or almost $2,300 per year. Over ten years, which is the amount of time we intend to keep the Leaf, the total savings will probably be enough to buy another Leaf! So far, there were three things that had to be replaced under warranty. The parking brake actuator, the Telematics Communication Unit (TCU), and the power lock in one of the rear passenger doors. Out of the three, only the parking brake actuator needed an emergency service, although I was still able to drive the car to the dealer. The electric power train on the other hand has been working flawlessly. After two years, there were only two things I had to replace on the LEAF as part of a regular maintenance: the cabin air filter, which I already mentioned, and more recently, the two front wipers in preparation for its third Canadian winter. The dealer performed the two mandatory annual services that included software updates (no cost). I also chose to perform the optional six-month services in between, mostly because they fall right after the salt-and-sand season we call Ottawa’s winter. The scheduled services cost an average of $136 each (excluding the cabin air filter). Even though there are quite a few public charging stations now in the Ottawa-Gatineau region, they are all Level 2 stations which still take a long time to charge. DC Fast Chargers are still not available anywhere, not even at dealerships like in the U.S. Unfortunately Nissan Canada hasn’t done any effort to get them installed north of the border and that’s particularly frustrating. DC Fast Chargers would allow me to do trips that I can’t do today in any practical way. It would be a game changer for EV adoption but it’s not a vision shared by manufacturers in Canada (other than Tesla, who’s right now is building super chargers at the 401in Kingston). The Leaf is definitely the car we drive the most in the family. Our second car (my wife’s car), which we also use for longer trips, only drove 17,000 km since we first got the Leaf. In other words, the Leaf drove 2.5x as much as our gas car, showing that we only drive it when we really have to. We love to drive the Leaf. Even my son is driving it now. That’s why it’s so frustrating to take the gas car on a longer trip that we know the Leaf could do if only the Nissan dealership along the way had DC Fast Charger. Electric vehicles convert up to 62% of the electrical energy from the grid to power at the wheels. Very little is wasted as heat. I took this picture after a one hour drive during a snow storm here in Ottawa. The snow that fell on the hood didn’t melt. It looks like I was just park outside. Most people don’t realize this but about 80% of the money you spend on gas is actually lost/wasted by your car engine. Internal combustion engines are very inefficient at converting the fuel’s chemical energy to mechanical energy, losing most of it to engine friction, pumping air into and out of the engine, and wasted heat. You’re basically buying gas to warm up the hood of your car. It’s been 17 months since we first took delivery of our LEAF. Yesterday, as I was driving to work, I had to pull over and take this picture as we had just hit the 30,000 mark. For us, it’s an impressive milestone. I don’t think we’ve ever driven any of our past cars that much in such a short period of time, specially considering most of the driving on the LEAF has happened within the city. For comparison, our gas car only drove 12,000 Km during the same period, which shows that the LEAF is not a good second car like many say, but it is in fact the first car in our family. 30,000 Km also means a lot in terms of savings, for both our pocket and for the environment. Our gas car would have burned at least 2,500 liters of gasoline to drive the same distance, cost about $3,125 at the pump and thrown 6 tons of CO2 in the atmosphere. 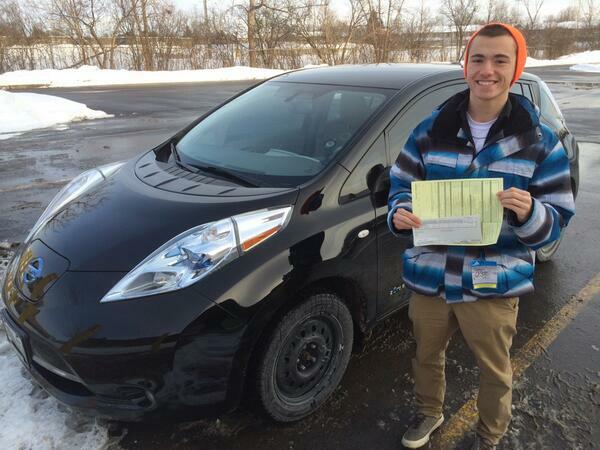 By comparison, the LEAF cost us about $470 in home electricity, without any gas, oil changes or tailpipes. On a yearly basis, we drove 21,496 Km in 2012, using just $333 of home electricity. That’s $28 per month, or half of a Corolla gas tank, to drive almost 1,800 Km. Overall, we saved $2,150 in gas, oil changes and car insurance last year. In terms of issues, the electric power train has been working flawlessly and I haven’t noticed any drop in battery performance or range. There were only two issues that required service under warranty and they were both unrelated to the electric power train: the parking brake actuator got stuck and had to be replaced, and more recently, the power lock actuator in one of the passenger doors also had to be replaced. Carwings remains the single most annoying thing on the LEAF. Nothing to do with the car itself, but with frequent outages in the telemetry service. The LEAF has also proven to be a very low-maintenance car. The only item we had to replace so far was the cabin air filter, a $20 part that you can buy on eBay and replace yourself, though I only discovered that later, after having the dealer change it for me (for $70). Without any oil to be changed, regular maintenance services are only required every 12 months. They cost the same as any regular car, minus $50 because there’s no oil change! Regular 6-month services are optional but I decided to have them performed as well because they happen right after winter for us, and its always a good idea to have things checked and lubricated after all the slush, sand an salt from ‘the Ottawa roads. They are also considered a “minor” service and cost a bit less than the yearly service. Finally and most important, the LEAF continues to be very very fun to drive! The instant torque, great acceleration, the low center of gravity (for sharp turns!) and all the quietness and comfort make it always a very pleasant ride. On to the next 30,000!